US Army Captain Christopher Couch salutes the flag during the 8th Annual Sticks for Soldiers 2013 Thanksgiving Lacrosse Classic at Fairfield Ludlowe High School's Taft Field in Fairfield, Conn. on Saturday November 30, 2013. Sticks for Soldiers is a non-profit charity lacrosse tournament involving high schools from all over Fairfield County, and which raises money to help wounded troops. One of the event's honorees is US Army Captain Benjamin Harrow, seated at right.Also honored was US Army Specialist Sean Pesce, who is seated at left. 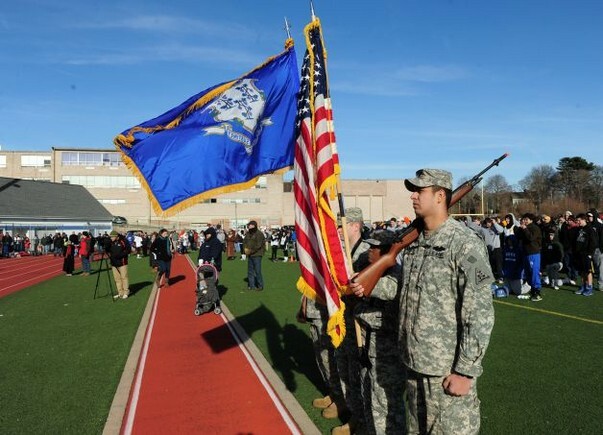 The Connecticut National Guard presents the colors, during the 8th Annual Sticks for Soldiers 2013 Thanksgiving Lacrosse Classic at Fairfield Ludlowe High School's Taft Field in Fairfield, Conn. on Saturday November 30, 2013. Sticks for Soldiers is a non-profit charity lacrosse tournament involving high schools from all over Fairfield County, and which raises money to help wounded troops. The event's honorees this year are US Army Captain Benjamin Harrow and US Army Specialist Sean Pesce. 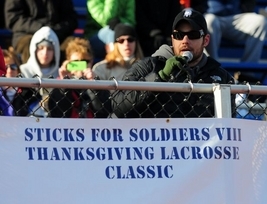 For the past 8 years, the Western Connecticut Lacrosse Officials Association has supported the Annual Sticks for Soldiers Thanksgiving Lacrosse Tournament. All participating WCLOA Officials donate their time to the Tournament . The fields of Fairfield Ludlowe High School were filled with the sound of clacking sticks, cheering parents and tweeting whistles Saturday afternoon as dozens of lacrosse teams from around the state faced off in a series of matches. Though lacrosse is usually a spring sport, 56 squads of high-school-age players and two teams of young children came together on a chilly Saturday afternoon to compete in the Sticks for Soldiers tournament to raise money for wounded combat veterans. With the blast of a horn after the second round of games, the on-field action came to a stop and the hundreds of players clad in multi-colored jerseys gathered on Taft Field to honor two Army veterans, Capt. Benjamin Harrow and Spc. Sean Pesce. 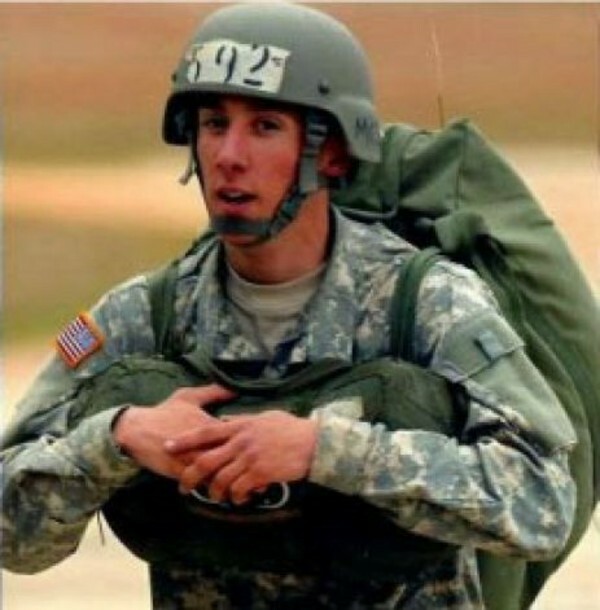 Harrow, who is originally from Brooklyn, N.Y., lost both legs after stepping on an IED in Afghanistan in May 2012. 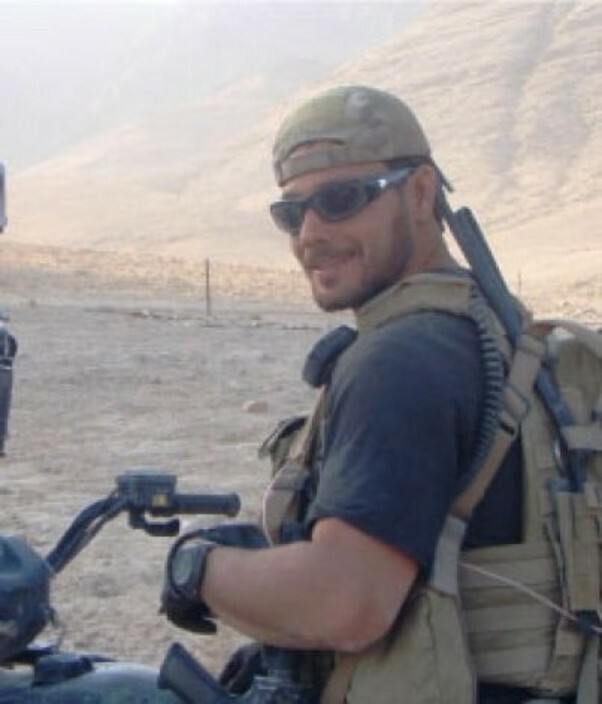 Pesce, a West Haven native, was paralyzed from the waist down after a firefight with Afghan rebels in October 2012. Both were in that stands Saturday and got a standing ovation from the hundreds and parents and players who were there. 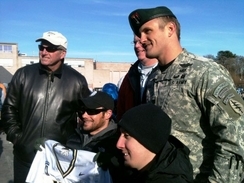 Former Army lacrosse coach Jack Emmer (far left) with Army Capt. Ben Harrow center), Sticks for Soldiers Tournament Chairman Jim Tommins (center right), Army Capt. Chris Couch, (right) and Spc. Sean Pesce (right front). Harrow is holding up his Army lacrosse jersey which Emmer gave to him at a ceremony during the tournament. 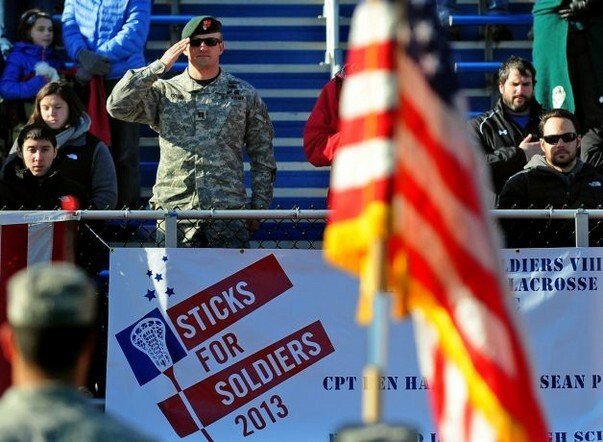 The 8th Annual Sticks for Soldiers 2013 Thanksgiving Lacrosse Classic at Fairfield Ludlowe High School's Taft Field in Fairfield, Conn. on Saturday November 30, 2013.